July 2018. RNAs are well known for their role in the translation of the hereditary information encoded in our genes. Over the last decade scientists have come to realize that RNAs have in addition many other important functions. The study of structure-function relationships of non-coding RNAs has been challenging however and they remain unexplored for many RNAs. A new method developed by chemists at Goethe University Frankfurt will aid biophysical studies of RNA function such as studies using light control or NMR spectroscopy. The investigation of non‐coding RNAs requires synthesizing RNAs that contain modifications at different positions within the oligonucleotide molecule. Solid-phase synthesis, the method used most widely for the synthesis of modified oligonucleotides, is not well suited for the preparation of longer RNAs of high purity. 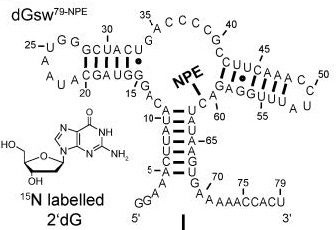 And targeting the incorporation of modified nucleotides to specific single positions is difficult with enzymatic synthesis. The Frankfurt team noew presents a novel chemo‐enzymatic RNA synthesis approach that allows incorporation of a wide range of modifications at any desired position in RNAs of any lengths.